4th/5th/6th Class boys and girls took part in the Castleisland district Mini-Sevens competition last week. Both teams played really well with the girls winning the competition for the third year in a row! They will now progress onto the County Finals in Tralee next week. Thanks to Ms. O’ Connor, Mr. Moroney and Sheila for accompanying the teams and to Mrs. Fitzpatrick for all her coaching. 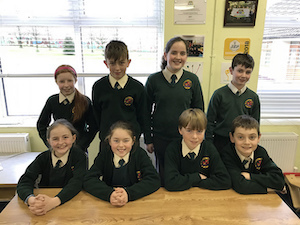 Well done to Jack, Alan, Seán, Gavin, Luke, Aidan, Mikaela, Máire, Rachel, Charlie, Tara, Katie, Mollie and Shauna in 6th Class on celebrating their Confirmation on Tuesday 26th March in Castleisland. It was a lovely ceremony celebrated by Bishop Ray Browne and many of the priests from the Castleisland parish and nearby parishes. He spoke to the children about embracing the gifts of the Holy Spirit in their lives. Thanks to everyone who made the day a really special one. 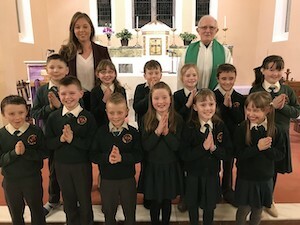 Well done to all of the boys and girls in 2nd class on celebrating their First Confession on Thursday 7th March in Scartaglen Church. It was a lovely ceremony celebrated by Fr. Seán Horgan. He spoke to the children about the importance of saying sorry when you do something wrong. A special word of thanks to their teacher Ms. Eilís McCarthy for all her hard work preparing the children for this special night. Scartaglen N.S. marched in the St. Patrick's Day Parade in Castleisland. Our theme was "World Book Day". It was great fun and despite the cold weather there was a brilliant turnout. The boys and girls made a huge effort with their costumes. 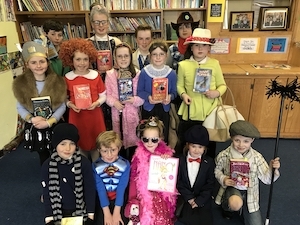 There were lots of literary characters represented from Harry Potter to Where’s Wally to Gangsta Granny and a selection of Princesses! Thanks to everyone who took part and made it a very memorable day. There was huge excitement as the pupils dressed up as their favourite literary character. They also brought in the book in which their character features and read an extract for their class. The staff even got involved with Harry Potter, The Mad Hatter and Charlie from Charlie and The Chocolate Factory roaming the corridors! We hope that World Book Day will spark an interest in books and foster a love of reading in the children. All of the activities that took place on the day had a focus on literacy. Each pupil received a book voucher that entitles them to claim a free book from their local bookshop. We were all treated to a wonderful day on Pancake Tuesday. 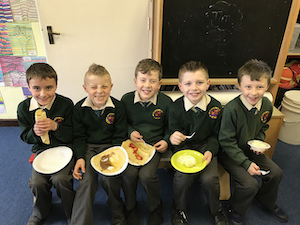 The Parent's Council worked very hard to provide pancakes for every child in the school. There were an amazing variety of toppings on offer including strawberries, blueberries, grapes, nutella, maple-syrup and even ice-cream! All proceeds from the day go to charity. A huge thanks to the Parent's Council for this special day which is certainly one of the highlights of the year for the pupils! We had a visit from Tony Kenneally whom works with Heritage Ireland recently. He visited 1st - 6th classes and showed us some amazing birds and animals. 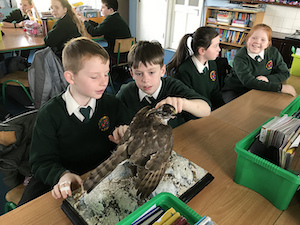 He taught us a lot about Irish birds and in particular about birds of prey. The highlight was the incredible stuffed Sparrowhawk and Peregrine Falcon! The boys and girls in 5th and 6th Class have been engaging in classroom debates throughout the year. 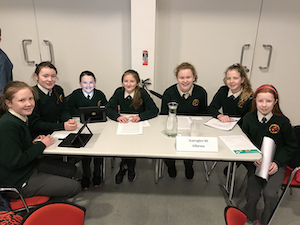 They recently had the wonderful opportunity of entering the Concern Schools Debating Competition in Tralee Education Centre. The topic of the debate was: “Climate Change is not our problem”. Scartaglen N.S. were proposing the motion. Well done to all the team who took part. It was an exciting debate and a great experience for the entire class. Thanks to Ms. O’ Connor and Mr. Moroney for all their help preparing for the debate. Well done to our two quiz teams that represented Scartaglen N.S. at the Credit Union Quiz in the Brandon Hotel, Tralee. The Junior Quiz team was made up of students from 3rd and 4th Class: Niamh O’ Donnell, Edel O’ Donoghue, Ryan Walsh-Murphy and Adam Caldwell. The Senior Quiz team was made up of students from 6th Class: Máire Daly, Jack O’ Donoghue, Charlie O’ Keeffe and Aidan Young. There were schools from all over the county represented. Both teams performed really well. They had a great day and enjoyed the quiz. Well done to all involved and a special word of thanks to the parents who provided transport and encouragement on the day. 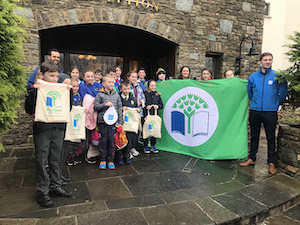 The Green Team attended a Water Forum in The Heights Hotel in Killarney recently. The children learned about marine pollution and ways to save water in school and at home. Irish Water spoke to the children about water treatment. They really enjoyed the day! Thanks to Mrs. Doody and Sarah and also to the parents who provided transport. 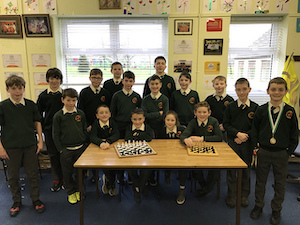 The school chess team took part in their first competition recently in Castleisland. 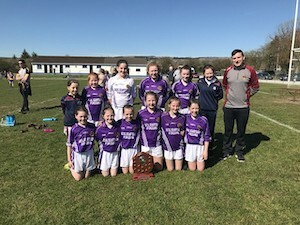 16 pupils from second class up to sixth class played in the competition. They were divided into teams of four with one of our teams winning medals. It was great fun and they really enjoyed taking part! Thanks to Ms. O’ Connor and Sheila for accompanying the team. 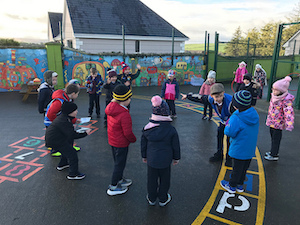 As part of our Active School Flag 3rd/4th Class have been helping the infants play games at break time. The Playground Leaders take it in turns to organise games and activities for Junior and Senior Infants. They are really enjoying the experience. Thanks to Mrs. Fitzpatrick for all her work on the Active Schools Programme. Scartaglen N.S. were delighted to be visited by the Sliabh Luachra Musician in Residence, Eoin O' Sullivan. He visited each classroom and played some tunes. 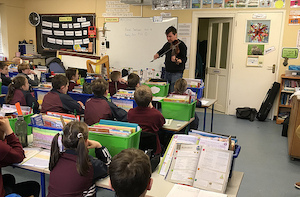 Eoin also invited children in the classes to play their own instruments and joined in for a trad session with 5th and 6th Class. It was great fun! We had a night to remember in Scartaglen Heritage Centre on the 13th December when we had our Christmas Show. 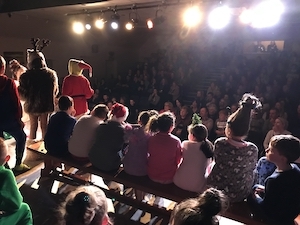 There were two shows with Junior & Senior Infants and 1st/2nd Class performing in the Junior Show and 3rd to 6th Class performing in the Senior show. There was a great buzz in the hall and everybody really enjoyed the show! Well done to all the boys and girls for working really hard preparing for this memorable night. A huge thank you to the teachers and staff for all their hard work. Scartaglen N.S. would also like to thank everybody for their generous donations on the night. 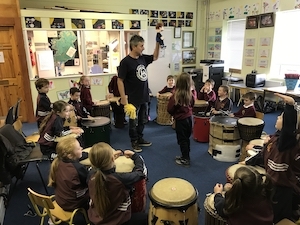 Junior Infants, Senior Infants and 1st Class took part in drumming classes with Urs Wenk each Friday while the rest of the school attended swimming. It was great fun and the children really enjoyed making their own music! We would like to thank the Parent’s Council for part-funding this event. 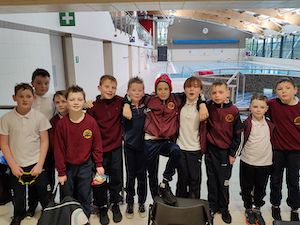 2nd - 6th Class travelled to Killarney Sports and Leisure Centre for 6 weeks of swimming lessons. It was very exciting heading off on the bus each Friday and we have all improved our swimming skills! Thanks to the Parent's Council for funding the bus for the 6 weeks. 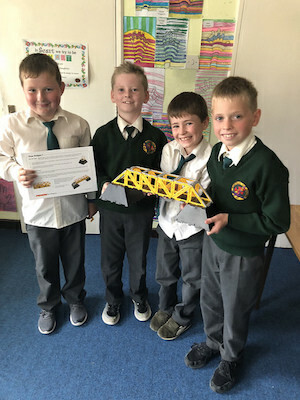 3rd-6th Class are taking part in STEM (Science, Technology, Engineering and Maths) every Thursday. They are learning lots of new skills including construction, engineering, coding and working with the green screen. They are also designing computer games and developing their maths skills on Khan Academy. It is a lot of fun working together and learning these new skills. 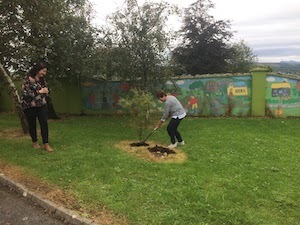 5th and 6th Class are taking part in the Crocus Project. As part of this Project they have been learning all about World War II and the Holocaust. They planted crocus bulbs to remember the 1.5 million children who died during the Holocaust. 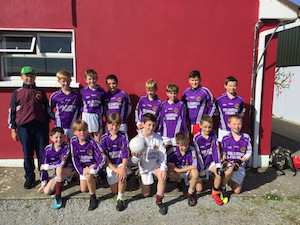 Well done to the Senior Boys Football team who won in the Cumann na mBunscol Football competition in Scartaglen recently. They played Kilmurry, Currow and Nohoval. They will now advance to the next round. Thanks to Mrs. Fitzpatrick for all her coaching. 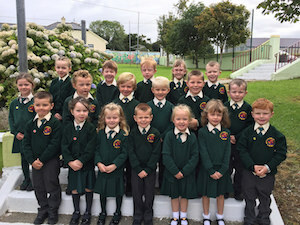 We are delighted to welcome our new Junior Infants to Scartaglen National School. We are sure they will be very happy in our school! Mrs. O' Sullivan came back to Scartaglen N.S. to plant a tree. All of the boys and girls were delighted to see her. Best of luck in your retirement! Junior Infants have been busy learning all about the Doctor's surgery in Aistear. We really enjoyed planting seeds and watching them grow. Everybody had great fun on our Spring walk looking for signs of Spring. We also made lovely pictures by printing with apples. Senior Infants had great fun with Michael Lynch coding bee-bots and challenging our classmates to successfully reach a final destination on a map. In Science we learned about different types of flowers. We went on a flower hunt around the school. We planted Pansy and Forget Me Not seeds. We are looking forward to our Easter Egg hunt on Friday! 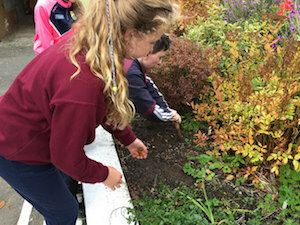 First and Second Class have been using our green fingers to plant sunflower seeds. We have been using scales in Maths to weigh objects and filling containers with water to investigate how much water they can hold. Congratulations to Second Class on receiving the Sacrament of Reconciliation. We now excitedly prepare for making our First Communion! We are learning all about "An Cháisc" as we look forward to Easter! 3rd and 4th Class have been busy writing Easter Shape poems. We are going to have a competition to see whose is best. We celebrated Seachtaine na Gaeilge by playing Irish games with the infants and taking part in a quiz and Céilií. We are learning about the Titanic at the moment and we are doing art and drama lessons based on it. One student even brought in a giant model of the Titanic! We have been learning about the dangers of smoking and how it can be very bad for your health. We designed posters to encourage people not to smoke as part of the "Be Smart, Don't Start" campaign. 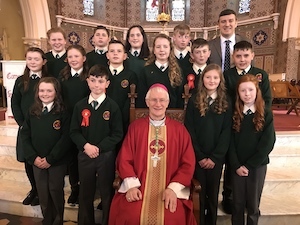 The 6th Class received their Confirmation in Castleisland on the 26th March. 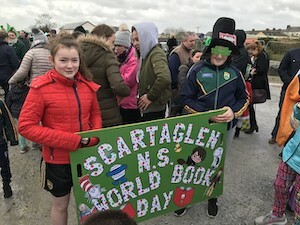 We really enjoyed World Book Day and all of the activities on the day. The girls were busy training for the Mini-Sevens and the training definitely paid off because the girls are now the County Champions! Well done girls!!! We can't wait for the Easter egg hunt before the holidays! !